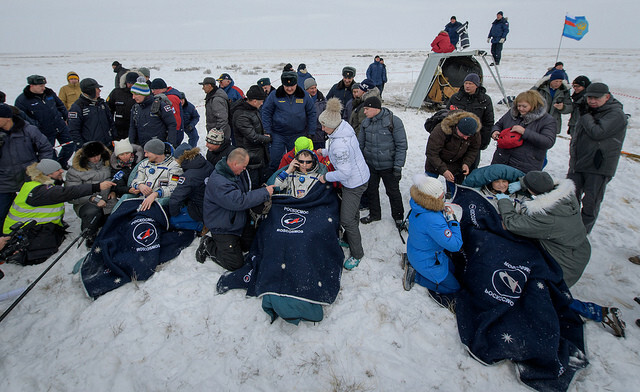 A little while ago astronauts Alexander Gerst and Serena Auñón-Chancellor and cosmonaut Sergey Prokopyev returned to Earth on the Soyuz MS-09 spacecraft, that landed without problems in Kazakhstan. The three of them spent a bit more than 6 months on the International Space Station, where they arrived on June 8, 2018 as part of Expedition 56. During the time spent on the International Space Station with Expedition 57, the three crew members conducting various maintenance activities and many scientific experiments. On November 7, the Japanese space cargo ship HTV-7 departed the Station. On November 18, the Russian MS-10 Progress space cargo ship reached the Station. On November 19, the space cargo ship Cygnus reached the Station on its NG-10 mission. On December 8, the Dragon space cargo ship reached the Station on its CRS-16 mission. During that time a space walk was carried out. Sergey Prokopyev and his Expedition 58 colleague Oleg Kononenko took about 7 hours and 45 minutes to collect some scientific instruments from the Rassvet module but above all to examine the Soyuz MS-09 spacecraft’s outer hull. The discovery of a hole in the spacecraft following an investigation into an air leak led to a number of hypotheses about its origin, including sabotage. The hole, that was patched with sealant, was in the orbital module that gets jettisoned before returning to Earth so they needed to investigate on the Station to gather information that could help understand the origin of what was a possible accident during the spacecraft assembly operations. There were some fears about other possible hidden damages but eventually the Soyuz MS-09 spacecraft performed well in the journey back to Earth. On Tuesday, December 18, Alexander Gerst officially handed over the command of the International Space Station to the Russian cosmonaut Oleg Kononenko, marking the beginning of Expedition 58. Due to the failure of the launch of two new crew members on October 11, 2018, the rotation has been changed and Expedition 58 will remain composed of the only three members remaining on the Station. They’ll also be part of Expedition 59, whose crew will be made up of six people again after being completed with the arrival of new members, currently scheduled for February 28, 2019.